Water damage can occur due to various reasons like floods, leakage in the plumbing system, broken pipes, sewage backups, storms, or poor functioning of the devices. In order to safeguard yourself and people from getting affected by the water damage, it is very important to know about what is the flood restoration process and preventive measures that would aid in restoring water damage and bringing it back to normal state quickly. In this step the professionals from the flood restoration company will visit your house and carry out an inspection. The technician would specify the necessary action to perform in order to reverse the adverse impact of the water damage. 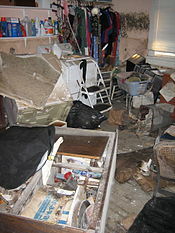 Any valuable contents if present in the home are removed and placed in a secure place. Now the main restoration task would begin. Professionals will make effort to clean up the space by picking up the material on the ground and extract all standing water immediately. This includes removal of all damp materials such as throw rugs, toys, pillows, clothes from the affected zone. Technicians would remove any kind of wet surfaces on ceilings, walls or floors to speed up the drying process. Doors and the drawers of the cabinet are opened and everything inside it will be removed to accelerate the drying process. In this way, technicians would identify all types of wet surface and help them make dry. After extracting the collected water and removing all the wet materials, one can start the drying process. In this process, highly trained professionals from water restoration companies make use of commercial grade appliances such as air movers, drying systems for wooden flooring, dehumidifiers and water heaters to produce dry air and enhance air circulation and evaporation. While this process goes on, the environment is precisely monitored on all days and based on the information the progress report is prepared. Care is taken to control the moisture which can otherwise give rise to the growth of mold. The whole procedure of drying can take around three to four days depending on the extent of the impact of damage. Once the drying process has been successfully done, certified professionals will perform another inspection to ensure that there are no traces of moisture that could lead to mold growth or further damage. They even keep closer eye on such buildings that have been severely damaged due to floods, and have been restored. Once all the above preventive actions for controlling water damage have been performed, the structure can be restored to original dry standard. If any building materials are needed for the restoration, then the replacement reconstruction is also carried out. On successful completion of this final step, you would find you premise back to its pre-damaged condition. Water damage restoration process is not an easy task. It requires good amount of knowledge, skills and experience in dealing with the various types of damages. Hiring a specialized water restoration agency would ensure that the all these steps are accomplished in a quick and effective manner.